Whilst every effort is made to describe the goods as accurately as possible we understand that sometimes 'it is not what you thought it was'. In these circumstances a refund will be made on all returned ‘sealed’ goods that are within 2 months of their Best Before date, providing we are notified of the problem within 24 hours of delivery and the products are returned to us within 7 days. We will deduct a 20% re-stocking fee and our carriage cost from the total refund amount. It is the customer’s responsibility to pay for the carriage of the goods being returned and we recommend that a certificate of posting is obtained from the carrier. Goods that are returned to us within 7 days of delivery and we consider to be faulty will be replaced or refunded in full. Orders cancelled before 3 pm on the day of despatch will be refunded in full minus a 5% payment/refund processing charge. If items are delivered in error by Bev Direct, please do not open them but notify us as soon as possible and return items within 7 days. Items that have been opened cannot be returned due to food hygiene reasons. 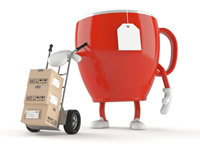 We will reimburse any carriage costs incurred by you for returning goods sent to you in error. If you have ordered the wrong item, please leave the box intact and contact us within 24 hours of delivery to discuss your options. If you have a faulty or missing product, please contact us within 24 hours of delivery. Any faulty product must be returned within 7 days to qualify for a refund or replacement. The carriage costs of returning the faulty goods will be reimbursed in full providing these conditions are met. A missing product will either be replaced or the cost reimbursed. When returning products to us we recommend that a certificate of posting is obtained from the carrier as proof of despatch.